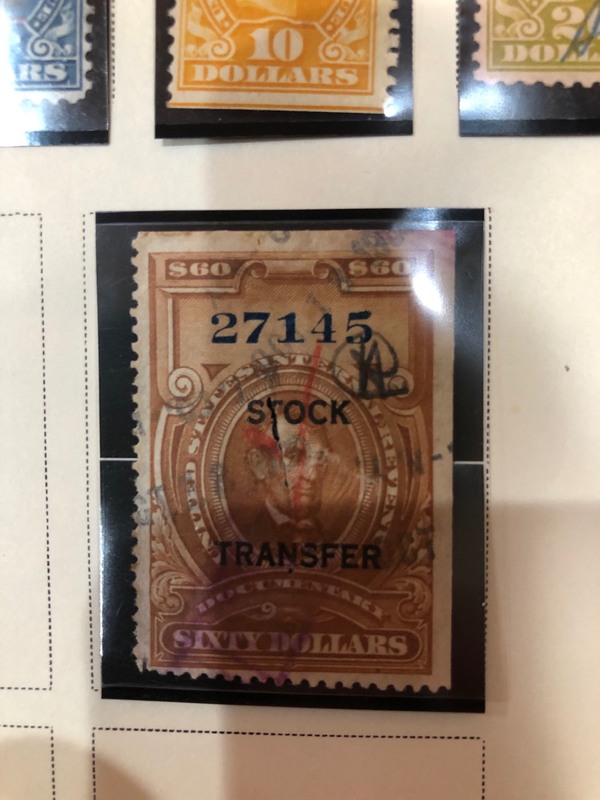 Quite an accomplishment, in a way, for one to painstakingly acquire hundreds of revenue stamps, and not one of which is sound, well centered, or without a straight edge or perfin cancel. You'd figure that, even accidentally, one or two decent stamps would get included, but it sure doesn't look like it. Almost like an "anti-collection," maybe? This is very funny! They have been through a storm; I sympathize. 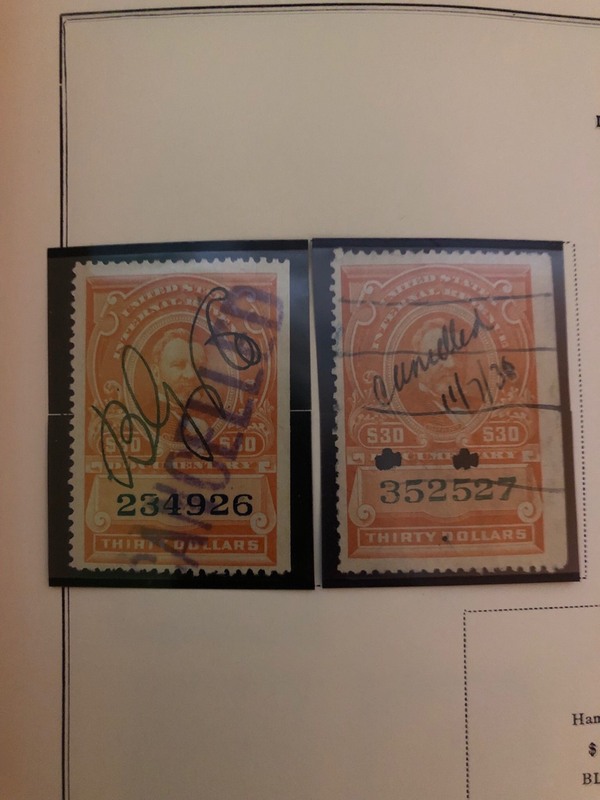 One of the blues has an upsidedown post-mark of Oct 8, 1880. Was this a roller stamp set wrongly? And, we don't see the backs. But, at 99 cents, ok if the postage is not sky high. The postage can always surprise. James, had a local collector, an accountant at that; who only bought the cheap, dirty, and damaged material and only if it was priced at 10% of catalogue or less. Needless to say when it came up for sale I did not need any of the material. Stockbooks and albums were worth more than the collection. I do not know if he ever saw any return on that collection. We all know we buy to enjoy and learn and will be lucky to get a partial or decent return when and if we sell, but nothing. Ugh! He would have been better off buying the most economical undamaged material instead. This collection should be named The Dog Pound. Not just poor condition, but pretty sparse as well, missing a lot of commons. That's how a lot of my Revenue stamps look. I'm in my 30's with 2 kids and going back to school to get my real estate license. Money is a little tight, so I don't care what it looks like for now, as long as it fills a hole in my album. years ago I met a collector who claimed to have a complete us collection in a scott national album and was invited to see it. 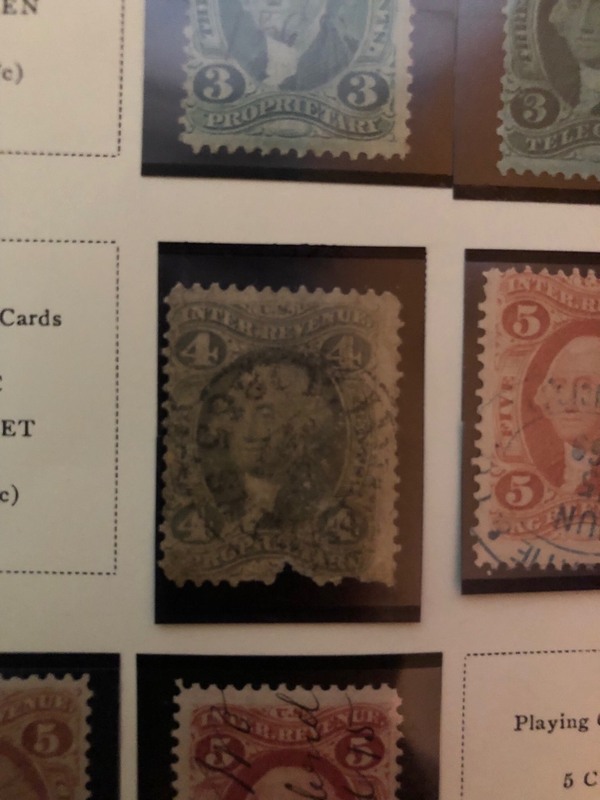 when I got the chance to view the album it was as stated, complete (and apparently properly identified) but each stamp in the group was in worse shape that the next, with the faults running the gamut. the collector revealed to me that he wanted only the worst example of each item that he could find. Oddly, truly dreadful Poor-grade (lowest coin grade) coins sometimes sell for more than their Fair or About Good cousins, just because somebody needs them for their low-ball sets. Collectors, whatever they collect, are a little eccentric. I beg to differ with that estimation. Well I've said it before. 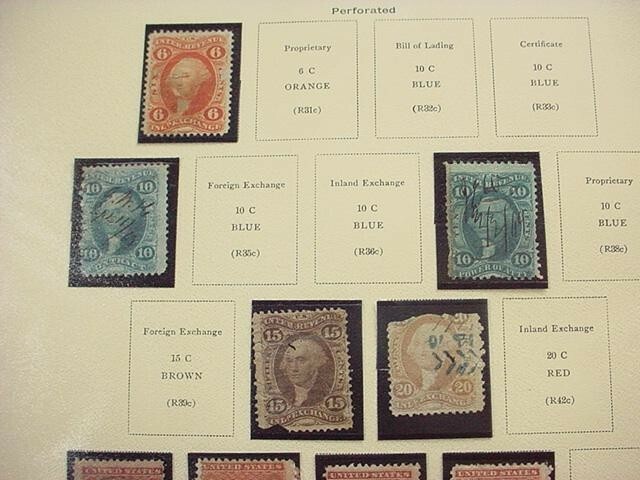 If anyone has any revenue stamps, R-RZ, or other BOB stamps (Postage Due, Official, Nespaper, Confederate, US possessions like Canal Zone Puerto Rico, or even Early issue cut squares) they want to get rid of, hit me up. I'm not specifically collecting ugly stamps, just hole fillers for now. Riped, oxydized, holes, doesn't really matter to me, I'll pay you for them if they are cheap. edit staff: should I have put that under "want to buy"? It is interesting that the collection is on cut down Scott pages in protective sleeves. It shows some conscious collecting method. Yes, it is not the best material but the original collector should not be judged harshly if this is what they did. When you see someone post here on a collection they obtained, it is often in very mixed condition and you expect something like this. Who knows? Noble Spirit's description is something else. It took 0.83 seconds to lick this stamp.